Fisco’s high quality calibration service on selected long tapes offer customers the assurance of the absolute precision of their own individual tapes. 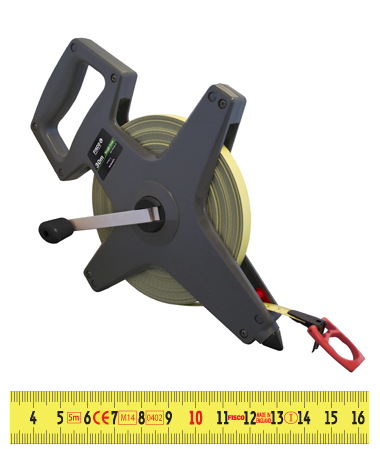 This service is vital for those who are required to have at least one calibrated tape on their premises, but it is also useful for a wide range of professionals and businesses, especially those selling timber and other building materials by length. A single calibrated tape can be used as a benchmark to ensure the maintained accuracy of all other tapes. Our calibrated tapes are carefully checked against a precision master scale and any deviation is noted. For a basic charge, the overall length of the tape will be calibrated but the service can be tailored to suit individual needs for an additional charge. For example, a tape might also be calibrated every five metres or at every metre for the first three metres. A laminated certificate validating the calibration is supplied with each tape, and all calibrated tapes are certified to EC Class I.